With their pleasing curves, these spacious pools provide and calm and restful environment for a labouring woman. 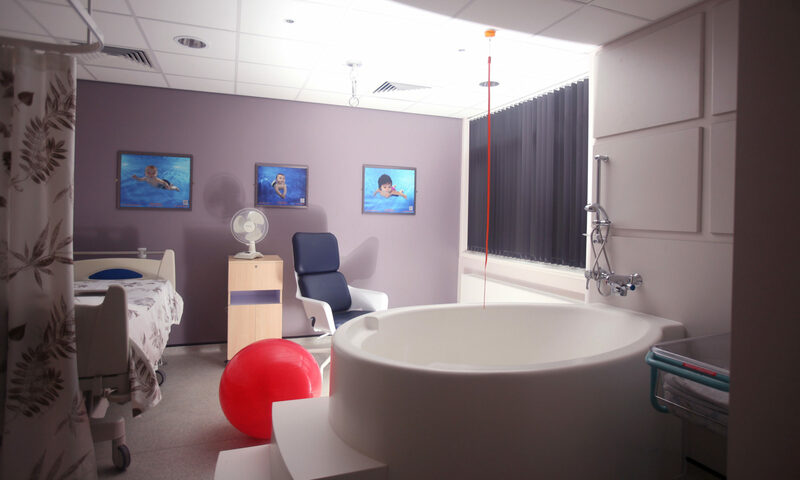 All of our elliptical baths have been designed with midwives, ensuring that the pool is comfortable for mothers and midwives to use. 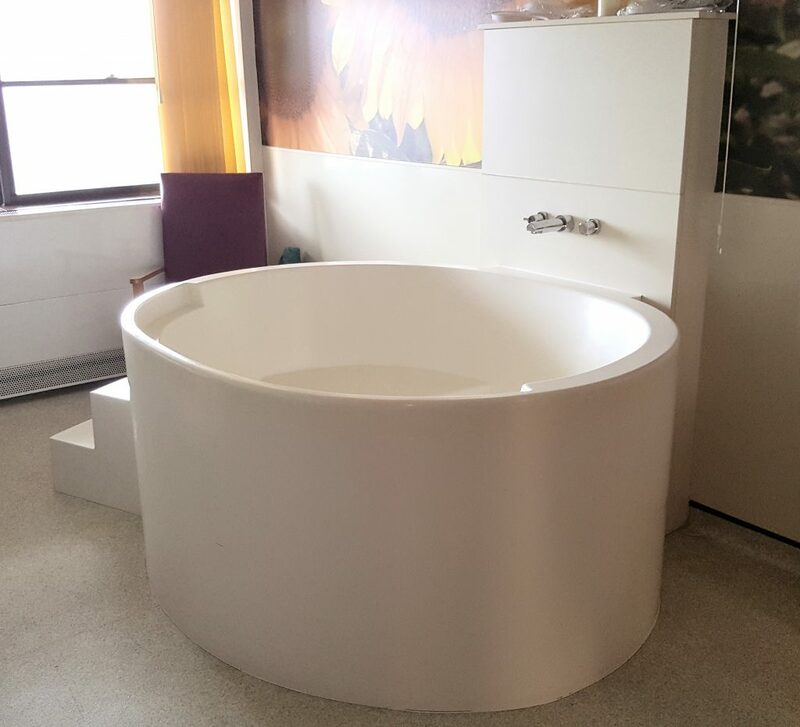 Our birthing pools offer a good depth of water and a pleasant, roomy environment, gently sloping sides and broad flat rim with arm rests so that the birthing mother can keep active and adopt a number of postures. All our baths have our single surface design for superior hygiene, ease of installation and to spread the load as efficiently as possible. Birth couch with these birth pools? Everything included, along with the bath, comes the step and even the main plumbing components: quarter turn plumbing valve (or plug and chain), and waterless trap. These are included in the price. A discount Mini SoftBirth birthing couch with Canberra, Venus and Heart-shape model is also included. A special offer has been arranged with SoftBirth. One-piece single surface construction for hygiene makes these easy baths to keep clean and sterilised. An arm rest / leaning ledge is integrated into the sides and also form a handle. Not only is this easier to keep clean than normal grab handles, it encourages open-handed gripping and relaxation. Designed from the plumbing up, so that it is easy to install and maintain. Flexibility designed in, hatchways, handles, steps, LED lights, poles: we can be flexible. 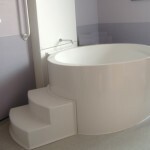 Our manufacturing process enables us to modify even our off the peg baths so do talk to us about your requirements. Quality of product and service. Made in Britain in accordance with BS EN 14516 and HTM64. We manufacture quality and provide full customer care from first enquiry right through to delivery, installation and beyond. All pools CE marked. Baths come with a 5 year guarantee. Material and Construction. The ‘single-surface’ construction which gives better hygiene and cleaning, also makes for stronger pool that does not need and expensive metal sub-structure. 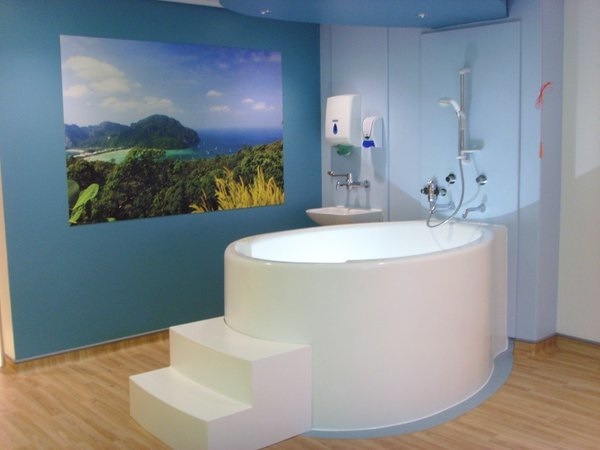 Also, we use fibreglass because not only does it give a hard, smooth surface that is ideal for hygiene, it is very strong and much more suitable to the hospital environment. For example, fibreglass is easier and cheaper to repair should it be accidentally damaged. 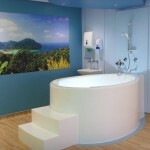 The gel-coat surface of the bath can withstand the rigorous cleaning regime of hospitals. For example, Chlorine based sanitizers with 10,000ppm available Chlorine are well within its tolerance. Our baths have a soft matt finish to make them more aesthetically pleasing and ‘softer’ looking whilst still being cleanable. The bath steps have a light texturing for enhanced grip whilst being comfortable to walk on and also be cleanable. Fitting and cleaning instructions are also provided. These can be emailed in advance. Delivery and Installation Service: We offer a full service from designing a bath just for you, right through to delivery and installation. If you want to just buy a bath, you can but we can also deliver and install or provide an onsite consultation or simply plumbing and installation support. Our service is about providing what you need to make a birthing pool work on your unit. A guide to installation can been found as a post. We can provide extras such as sheets of GRP tiling for wall covering. We can also make GRP-covered boards of varying sizes and thicknesses for IPS panelling and work surfaces. There are other reasons we can keep prices low. Our ‘single-surface’ construction, which gives better hygiene and cleaning, also makes a stronger pool that does not need an expensive metal sub-structure. When compared with other materials, fibreglass offers the better return on investment by giving a hard, smooth, hygienic surface that is more easily repaired. All this is backed by our 5 year guarantee for the workmanship of the bath itself. Any fitments are standard plumbing parts, so they give a proper seal and are cheap and easy to replace. We also had plumbers involved in the design as well as midwives!